Making Laundry Soap - Crochet, Starbucks and roadtrips, oh my! The other day I looked in our laundry soap container (it's actually one of those cheap bathroom trash cans 'cause it's the right size and I didn't want to go out and buy a bucket) and realized that we were getting a little low. First thing you need is to get some ingredients from the store. I got mine from WinCo, in the laundry soap aisle (right at the end). 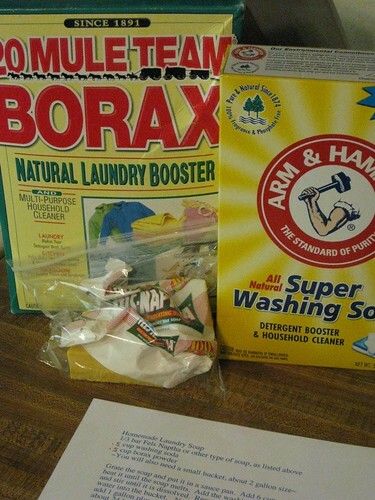 They are Washing Soda (like baking soda but with a slightly different chemical makeup), Borax, and Fels Naptha soap. You can substitute a soap like Ivory for the Fels Naptha, but you'll have to use an entire bar. First, grate 1/3 of the Fels Naptha bar. The soap is kind of strong, so I like to use gloves when I handle it. Dump it in a big pot and pour 6 cups of water in as well. 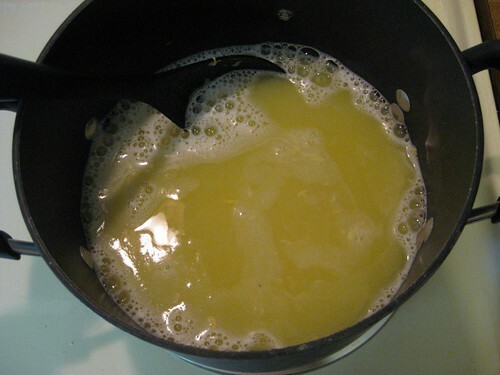 Heat it up and stir it a bit until the soap dissolves. It gets a little bubbly but not too bad. 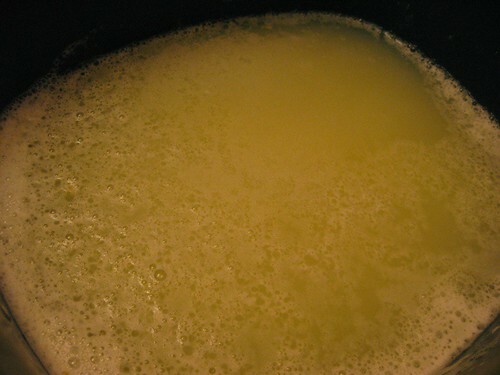 I don't bring mine to a boil, I just turn on the stove to medium-high and before it starts bubbling (as in the boil bubbles, not soap bubbles) it's usually done. 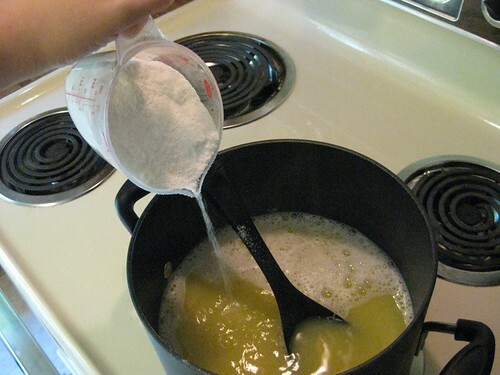 Add half a cup of washing soda and half a cup of borax to the melted soap. It feels like sand in the bottom of the pot at first, but it only takes a minute or two of stirring before it's all dissolved as well. While you're stirring and such, heat up 4 more cups of water by itself. I used my electric teakettle and stopped it right before it boiled. 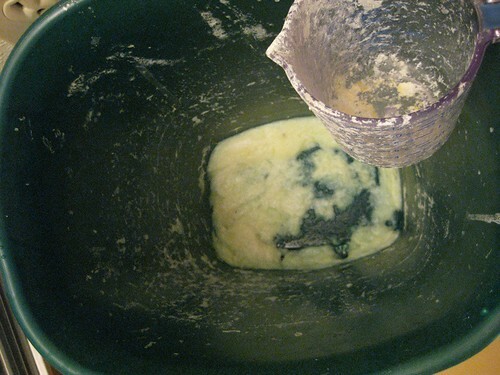 Put the water in the bottom of your bucket (or trashcan) and pour the soap mixture in next. Now you can add some essential oil if you want. The first time I made soap, Cory mentioned a few times that our towels didn't smell as fresh and clean as he's used to. I know a lot of the "freshness" is the chemicals from the soap and the dryer sheets, so I thought I'd try to replace the chemicals with some essential oils. I put in 20 drops of lavender, 10 drops of eucalyptus and 5 drops of rosemary. It was quite a bit under what the website I used called for, but I didn't want to drop an entire $8 .5-ounce bottle of oil just for one batch. We'll see how well this smaller amount works. Then fill the bucket with another gallon plus 6 cups of water, straight out of the tap. Now all that's left is to let it sit for 24 hours. It's fun to go shake it a little, periodically, and see how it congeals. 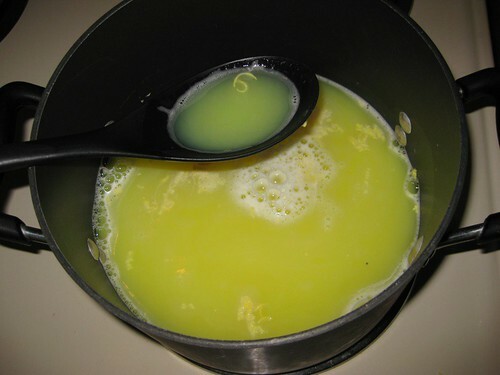 The website I used for the recipe says it's not supposed to be completely gelled, it's kind of watery. The last time I made this it was kind of chunky, almost like smooshed canned pears. (The color is kind of the same as well.) Kind of gross, but when you consider that this recipe makes enough for 64 loads of laundry, and it comes out to just about a penny per load, it's worth it I think. It is fun! I was singing "Stirring and stirring and stirring my brew" in my head the whole way through. very cool! I made my own all-purpose cleaner and put such delicious smelling oils in it that I look for excuses to use it now! 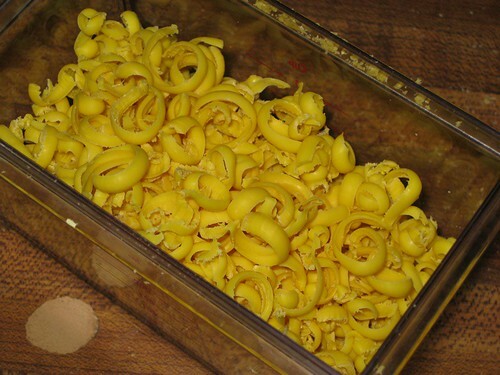 No, just some recipe I found online. But it's probably pretty similar. Did you find washing soda? No, I'm not sure where to look (I mean, the laundry aisle, yeah, but..). Asda doesn't have it. I'm going to try the Co-Op next week when we go into town. This is a great blog! I will have to try the wet recipe. 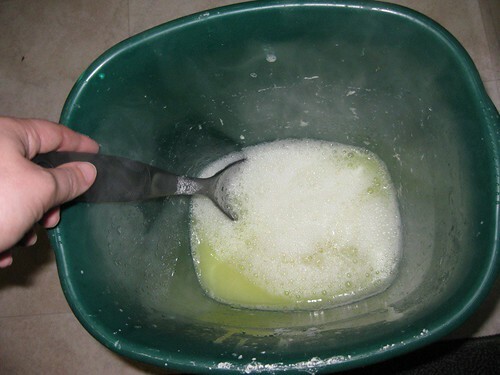 I have made my own laundry soap before by just grating a bar of glycerin soap and adding to the washing soda and borax. Kept it in a tub and scooped it out like convential store bought dry laundry powder. Worked great and was fun bu this process looks intriguing. If you do not want to use a large amount of expensive essential oils, you can put a few drops on a washcloth and toss it in the dryer with the load. Also, I keep bars of that Bee and Flower Sandalwood soap in my dresser drawers. I like the oil-on-a-washcloth idea! I'll have to try that sometime. And I love that sandalwood soap, though I've never put them in my drawers (we actually have our clothes on shelves) I love to use it on myself! In my last place, mine was also in the kitchen! I ended up getting big cutting boards and using them as counterspace because we didn't have much. That wall went washer, dryer, stove. Very strange. For posting this! You make this seem very accessible and easy, I'm planning on giving this a go when my regular detergent runs low.